Mormons believe that ancestors of some Native Americans were the first people that the Savior ministered to when He appeared in the Americas after His resurrection. One of the groups of people mentioned in the Book of Mormon is the Lamanites, described as rivals to a more religious people known as the Nephites. The introduction to the Book of Mormon states that the Lamanites were “among” the ancestors of the American Indians. According to the text, the Lamanites are descendants of Laman and Lemuel, two rebellious brothers of a family of Israelites who crossed the ocean in a ship around 600 BCE. Their brother, Nephi, is portrayed as founding the rival Nephites. The text states in 2 Nephi 5:20-22 that after the two groups separated from each other, the Lamanites received a “skin of blackness” as a sign of their being cut off from the presence of the Lord, and so that they would “not be enticing” to the Nephites. Wherefore, the word of the Lord was fulfilled which he spake unto me, saying that: Inasmuch as they will not hearken unto thy words they shall be cut off from the presence of the Lord. And behold, they were cut off from his presence. And he had caused the cursing to come upon them, yea, even a sore cursing, because of their iniquity. For behold, they had hardened their hearts against him that they had become like unto a flint; wherefore, as they were white, and exceedingly fair and delightsome, that they might not be enticing unto my people the Lord God did cause a skin of blackness to come upon them. And thus saith the Lord God: I will cause that they shall be loathsome unto thy people, save they shall repent of their iniquities. After centuries of wars among the two groups, Jesus Christ appeared and converted all of the united Lamanites and Nephites to Christianity. However, after about two centuries, many of the Christians began to fall away and identified themselves as Lamanites (see 4 Nephi 1:20), while those who remained true to the faith, identified themselves as Nephites. The Book of Mormon describes a series of great battles which ultimately occurred, ending with the Lamanites annihilating all of the Nephites (see 4 Nephi 1:35-39). The Lamanites, from whom some present-day Native Americans descend, remained to inhabit the American continents. The Book of Mormon contains many promises and prophecies about the future directed to these survivors. For example, Lehi’s grandson Enos prayed earnestly to God on behalf of his kinsmen, the Lamanites. He was promised by the Lord that Nephite records would be kept so that they could be “brought forth at some future day unto the Lamanites, that, perhaps, they might be brought unto salvation” (Enos 1:13). The role of Native Americans in the events of the last days is noted by several Book of Mormon prophets. Nephi prophesied that in the last days the Lamanites would accept the gospel and become a “pure and delightsome people” (2 Nephi 30:6). Likewise, it was revealed to the Prophet Joseph Smith that the Lamanites will at some future time “blossom as the rose” (Doctrine and Covenants 49:24). After Jesus’ resurrection in Jerusalem, he appeared to the more righteous Lamanites and Nephites left after massive destruction and prophesied that their seed eventually “shall dwindle in unbelief because of iniquity” (3 Nephi 21:5). He also stated that if any people “will repent and hearken unto my words, and harden not their hearts, I will establish my church among them, and they shall come in unto the covenant and be numbered among this the remnant of Jacob [the descendants of the Book of Mormon peoples], unto whom I have given this land for their inheritance”; together with others of the house of Israel, they will build the New Jerusalem (3 Nephi 21:22-23). The Book of Mormon teaches that the descendants of Lehi are heirs to the blessings of Abraham (see Abrahamic Covenant) and will receive the blessings promised to the house of Israel. In 1853, Mormon settlers established an outpost in Shoshone country known as Fort Supply where a number of Shoshone sought refuge among the Mormons during the winter months. Envisioning this as an opportune learning experience, the Mormons sought to learn as much as possible about the natives’ marriage customs, burial rites, and the tribal roles of medicine men. In addition, they also studied the Shoshone language. Brigham Young, the President of The Church of Jesus Christ at that time, established the Southern Indian Mission and stressed that missionaries needed to learn the languages of the Indians in order to teach them. In 1855, 27 men were called to serve as missionaries in territories north of Utah which were inhabited by the nations of the buffalo-hunting Indians of the Bannock, Shoshone, and Flathead. The missionaries began their work and settled on the banks of the Salmon River in Idaho to work with the Bannock, with the mission itself being located near a site where the Bannock, Shoshone, Nez Perce, and Flathead met each summer for gambling and horse-trading. The Native Americans were friendly towards the missionaries and ensured them that they were welcomed to use the land for farming. Part of the missionary efforts included holding classes to learn the Shoshone language, and as a result of their efforts, they soon baptized 55 Indians. However, as the Latter-day Saints had become well accustomed through the many years of persecution in their history, along with the sweetness came the bitter, as not all Indians welcomed them with open arms. In 1858, a Mormon mission in Idaho, Fort Lehmi, was attacked by a war party of about 200 Bannock and Shoshone warriors leaving two Mormons dead and five wounded. The Indians took as their bounty 250 cattle and 29 horses. As a result of the attack, the mission was abandoned. According to an article titled “19th Century Mormon Missionaries & the Shoshone”. . . . In 1873 Mormon missionaries under the leadership of George Washington Hill traveled to southern Idaho where they baptized about 100 Shoshone and Bannock. Speaking to the Indians in their own language, Hill told them about the Book of Mormon and depicted its story by placing pictures on a scroll. The baptized Indians were then settled on farmland near Brigham City, Utah. The Indians named the new community Washakie, after a Shoshone Chief. In 1875, Shoshone chief Pocatello traveled to Salt Lake City where he demanded to be baptized by the Mormons. In addition to Pocatello, five other Shoshone men and four Shoshone women are baptized. Pocatello predicted that many more would follow seeking spiritual salvation. In 1875, a Mormon missionary gathered a number of Shoshone on a spot between Malad and the Bear River in Idaho. They put in 140 acres of corn, wheat, and potatoes. The missionary then began a series of evangelical meetings which resulted in 574 baptisms. The Mormon missionary, Amos Wright, explained to the Shoshone the contents of the Book of Mormon, their relationship to the Lamanites, and the promises that God made to them. Wright spoke to them in broken Shoshone, but in spite of this his talk made such an impact upon those assembled that 87 requested baptism. Washakie and 17 of his family members converted. Wright baptized 422 Shoshone during a four-week time period. The interaction between the Mormons and the Native Americans remained friendly until conflicts began to evolve over the use of the limited resources that were available. Young’s plans to move to the Great Basin had not taken into consideration that the Native Americans were already using its resources to full capacity. As Mormons poured into Salt Lake City, settlers appropriated rivers, streams, and springs. They fenced off productive land and used up raw materials such as pine-nut bearing trees. This caused no immediate conflict, but upon discovering their loss, members of the local Ute tribe demanded access to their resources and, when denied, simply did what they had long done and took what had been theirs. As the Mormon population grew, tensions escalated. Infertile soil and a lack of water made it impossible to quickly create dense, sedentary settlements, so Young sent newcomers farther from Salt Lake City. Unwilling to change plans, he advised against provoking the Native Americans, but soon allowed ruthless punishment of any Indian caught stealing or harming a settler or his property. In a short time, church leaders authorized attacking American Indians who refused to give up their resources without a fight. Church leaders argued that Native Americans who resisted were actually rejecting Christ’s message and, by refusing, justified retribution. If your great-great-grandmother was ¼ Cherokee, then it was her grandparent that was 100% Native American. And that would be your 4th-great-grandparent. Now your great-great-grandmother would get 50% of her DNA from her mother and 50% from her father. To make this easy, let’s divide by 2 for every generation. Using the information given above as a reference, it then follows that the amount of the great-great-grandmother’s DNA that the reader is likely to have is about 1.5625% which is not necessarily enough to detect Native American ethnicity. The interaction between Mormons and Native American peoples today is somewhat different. Missionaries from The Church of Jesus Christ of Latter-day Saints are sent to teach the gospel on Indian reservations. As a result, the Church has witnessed significant growth in membership among various tribes as churches of other faiths in the surrounding area continue to struggle in maintaining a sizable membership. For example, membership in the Tube City Stake in Arizona which covers 150 miles of Navajo and Hopi lands, has increased by 25 percent since 2008. To attract followers, Larry Justice, a white man who is the President of the Tuba City Stake, took a page from the lives of Navajo ancestors and began a gardening program to teach people how to live off the land. He and a handful of church volunteers teach gardening techniques, distributing seeds from a plot behind the church building here. The program started with 25 gardens four years ago, each made by Navajos next to their homes. There were 1,800 gardens last month, and by next year 500 more are to be created in Tuba City and communities all around it, Mr. Justice said. Participants learn how to fertilize the soil, parched by years of drought. They learn to build fences to keep out the animals that roam the land. They learn what to harvest and when: melons and grapes in the summer, squash and cabbage in the fall. 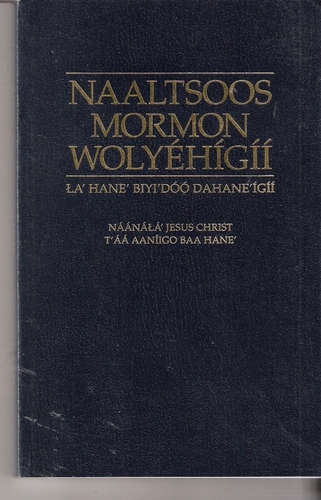 According to the statistical reports of The Church of Jesus Christ of Latter-day Saints, there are presently 15,082,028 members world-wide, divided among 29,253 congregations, with the Book of Mormon being translated into 189 different languages. Of the total Church membership, approximately one-quarter live in South America.